Forget crepes—Theresa and David Flaherty were all about the ice cream sammies while vacationing in Monaco. It was all sunshine and flowers for Brad and Alison Clancy with baby Kristen in Aruba. Jean Marc Nelson, Swietlana Wilczkiewicz, Liz Skinner Clarke, Kevin Fraser, Nataliya Brezden Nelson, Maurva Moseley and Steven Stuart ran some new uniform ideas by Hilary Knight on a trip to Bali. Monya Fiore and Aline P. Zoldbrod pirouetted and jetéd through Cape Town, South Africa. Newlyweds Brian Taranto and Michelle Vitagliano caught our Wedding issue’s bouquet on their honeymoon in Bora Bora. Mimi de Quesada and John Bartley ordered the pollo after a gondola ride in Venice. John and Dante Volpacchio erupted in cheers when they finally arrived in Pompeii, Italy. Bill Sides took it easy with our Fall Arts issue, paying tribute to the Eagles in Winslow, Arizona. Elaine Schear and Donna Spiegelman gave LA-based, Boston-schooled Iliza Shlesinger a new coastal view in Positano, Italy. Zina and Tim Waldron had some backup muscle from our Patriots issue to hold up the Tower of Pisa in Italy. Patricia Adamson, Nadina Talukdar, Audrey Evans and Victor Ortiz weren’t chicken atop Dubai’s Burj Khalifa. Nellie Knight and Michelle Ward danced in the surf with our Fall Arts issue in Bermuda’s Horseshoe Bay. Heather Balderrama and William Clapp took a mud bath with Olivia Culpo and David Ortiz in Costa Rica. Anthony Ishak had a Freak Out! sesh at the Frank Zappa memorial in Vilnius, Lithuania. Dan and Madolyn Sullivan got time off for good behavior during a visit to the Cork City Gaol in Ireland. Lew Victor sat in the horn section on the Savage River trail in Alaska’s Denali National Park. Peter Spang Goodrich and Kristie Mewis chatted with Molly Malone on her break from selling cockles and mussels in Dublin. Laura Poochigian put the ice in Iceland while enjoying our Summer Dining issue at Gullfoss Waterfall. Jim Desrosiers and Angela Stamoulos packed a perfect beach read for their vacation in Samos, Greece. Katrina Strikis and Iliza Shlesinger discussed the merits of cropped pants in Capri, Italy. Melanie, Elijah and Adnai Mendez made some time for Olivia Culpo at the Royal Greenwich Observatory in London. Angelina and Veronica Kemmett shared their ice cream rations in Charlottetown, Prince Edward Island. Mary DiZazzo-Trumbull and David Trumbull took the arts to heart when they celebrated their anniversary at the Tennessee Williams Theater Festival in Provincetown. 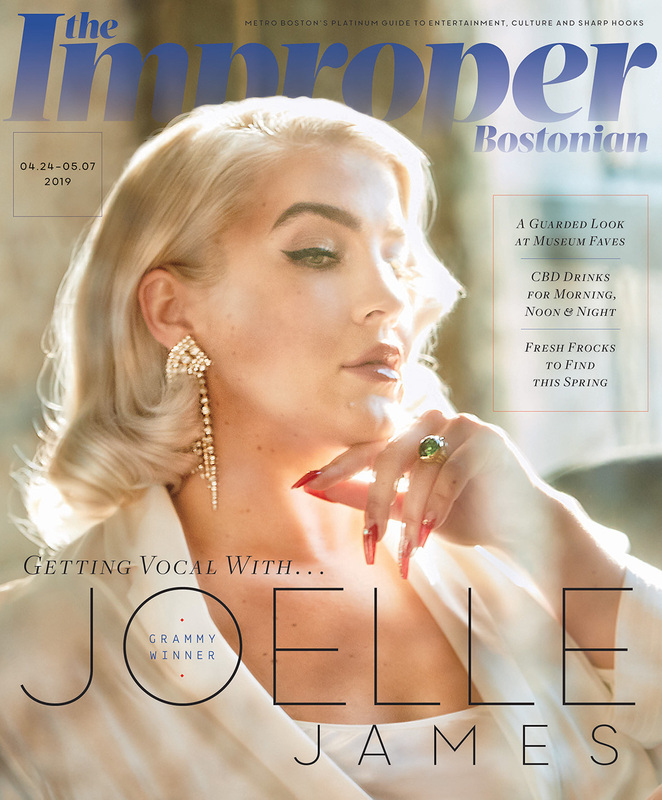 Talk about the underground scene—Kristine Burke spotted our Music issue beneath the corner of Tremont and Boylston Streets. Jason Truong found noodle nirvana at the peak of Expedition Everest at Walt Disney World in Florida. Christopher C. Corcoran enjoyed a private Pvris set (and great acoustics) in Matagalpa, Nicaragua. Cameron Esposito was a little over-dressed for the occasion when she hung out with Kevin Bugbee and friends at Coconut Tree Divers in Roatan, Honduras. Audrey Kallio Huntley, Kristin Kallio Caley, Sarah Kallio and Glynis Hamel name-dropped their way through the Kallio district of Helsinki, Finland. Caryn Beth Lazaroff and Debbie Cable became Boston’s Best traders on the floor of the Tel Aviv Stock Exchange. Kaia Corthell and Eva Putnam got brain freeze at the Palace of the Dukes of Burgundy in Dijon, France. Lisa Iaccarino and Mary Christine Kwiatek brought Xander Bogaerts (and some Beantown pride) with them to the Cloud Gate bean in Chicago. Camilo Vasquez was glad to read that Red Sox hats are so in as he caught up on our Summer Style issue in Seville’s Spain Square. Brandon O’Connell and Karitas Arnardottir scored a great spot for their upcoming nuptials at Hótel Búdir in Iceland. Ken and Kim Fougere took our Drink issue to a dad-daughter happy hour at Morro Castle in Puerto Rico. Honeymooners Kevin Li and Kristen Garrity enjoyed some cold treats while touring Cavtat, Croatia, but vows were tested early when a cup vs. cone debate got heated. Boston Marathon alumni Sandy and Jim Steen gave Baron Vaughn a speedy lift to the peak of Arthur’s Seat in Edinburgh, Scotland. Brynja Einarsdottir and Orn Almarsson got their French kicks with Kristie Mewis while visiting the Eiffel Tower in Paris. Karen Wheelock bundled up with Baron Vaughn before taking a dip in Iceland’s Blue Lagoon. Sindi, Tereza, Simon and Mason Bendo mastered the pageant wave when Miss Universe Olivia Culpo accompanied them to the Obamas’ front lawn in Washington. Ruth Casil and Ray Hickey didn’t have to sing the blues with Grace Kelly during a trip to Ninomaru Palace in Kyoto, Japan. Rob Vassegh made sure to pack some frozen treats for his trek to the top of Calton Hill in Edinburgh. Inspired by his fondness for the Green Monster, Robin and Gerry Paul kicked off a worldwide wall tour with David Price on the city wall in Dubrovnik, Croatia. Erika and Ben McElroy surprised Kristie Mewis with a visit to the world’s largest soccer ball at Epcot. In honor of our 25th anniversary, former Improper account executive Paul Ward took Katharine McPhee to check out our old digs in Brookline. Abby Armstrong, Eileen Vanderwalle, Jake Roy, Maya Volapacchio and Mikayla McCarthy had a ball in Brazil. Steve and Paulette Black were jazzed to tour the Western Wall and Tower of David with Grace Kelly in Jerusalem. Good thing they packed shades- Brianna Belanger and Stephen Monaco had Katharine McPhee soaking up the sun at the Key West Sponge Market in Florida. Sylvester and Emilia Zeigler reached for the sky with Jake Lacy in Kuala Lumpur, Malaysia. Rich and Kathy Glennon showed off their summer style with Jean Wang in Delray Beach, Florida. Grace Kelly helped Feruza Aripova brighten up a cloudy day of sightseeing in Vilnius, Lithuania. Forget the Green Monster- Jovon Williams and David Price enjoyed the blue waters on a trip to Playa del Carmen, Mexico. GOOOOAAALLL! Bjarki and Hal Arnarson teamed up with Kristie Mewis to root for Iceland at Stade de France stadium in Saint-Denis.